ACTITO released some major updates to the platform with their End of summer release. Rolled out over the last three months the newest version of the platform includes improvements on the mobile functionalities – both SMS and push notifications – and new transactional email and e-commerce offerings. 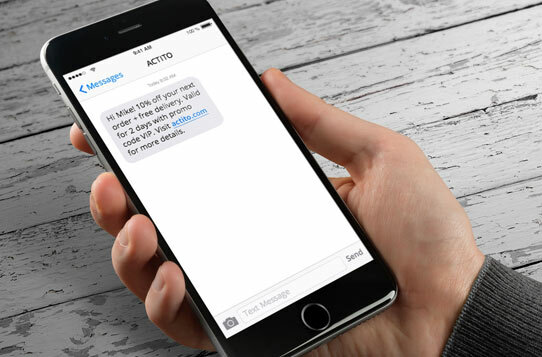 Next to the marketing emails, ACTITO now offers a seperate processing for transactional emails. A different kind of handling is made for immediate throughput and fast send-out, which is especially important for High-Priority messages like registration and order confirmations. In addition to a dedicated infrastructure for transactional emails, ACTITO offers specific alerting, monitoring and reporting tools and processes for this email type. Sequentially the email headers are different and there is a Service level agreement regarding transactional email available. Transactional emails can be triggered either by an event / scenario in the platform like shown below, or via a direct API call. Marketers can now send push notifications to their mobile app users. The mobile push channel can be used for immediate broadcast campaigns and event-triggered scenarios. Push notifications can be used in conjunction with SMS (or in an if/else variaty) to increase customer engagement on mobile. Transactional SMS: Transactional and marketing SMS can be marked separately with transactional given priority processing. The new E-commerce API offering allows ACTITO models to be accessible across e-commerce platforms like Prestashop, Shopify, Drupal or even your custom-developed shops – through the e-commerce API. A marketer can transfer and synchronize e-shop data including customer order details and abandoned carts to ACTITO and set e-commerce marketing automation scenarios in place such as welcome emails, birthday offers, restock reminders, after-sales surveys or abandoned cart emails. These updates and functionalities have been made available to ACTITO users.